New SqueekyKleen™ cleans and fans fiber in two wipes without alcohol, saving time and money. Hear the difference! No follow-up with alcohol required to get fibers squeaky clean and separated when prepping for splicing. SqueekyKleen™ is less harsh on hands and reduces chemical odors and vapor concentrations to a minimum in splice trailers and vaults. 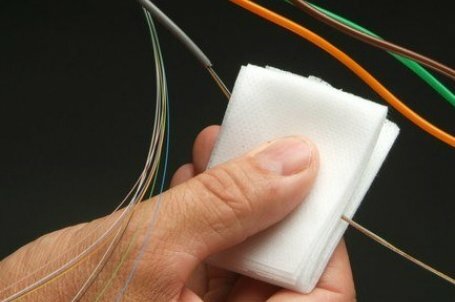 SqueekyKleen's™ unique formulation and specially designed high-performance towelette work to remove pik from the entire surface of loose-tube or ribbon fibers, leaving no residue. 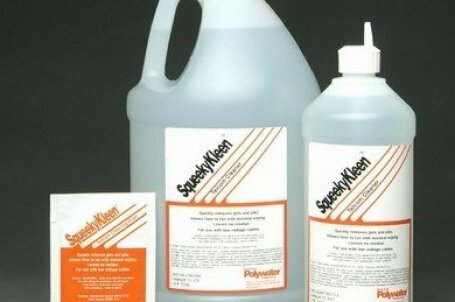 SqueekyKleen™ helps keep splice equipment clean of contamination for better fiber alignment and splice quality. Safe on acrylate and Mylar®.